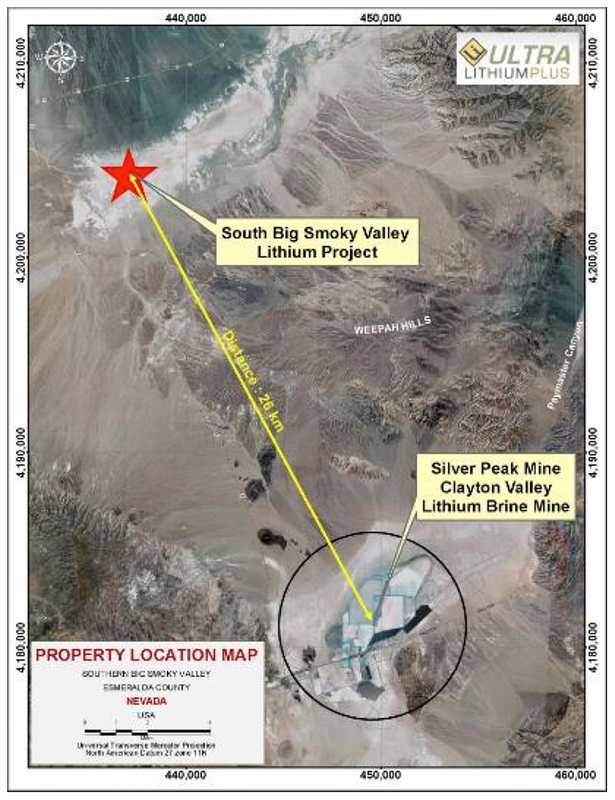 Ultra Lithium holds a 100% interest in the Big Smoky Valley Project located in Nevada. This Project has geological conditions favourable for hosting Lithium enriched brines. The Project is located 26 km to the north of Albemarle Corp.’s Silver Peak mine (previously Chemetall), which has been producing lithium from brines since 1966. 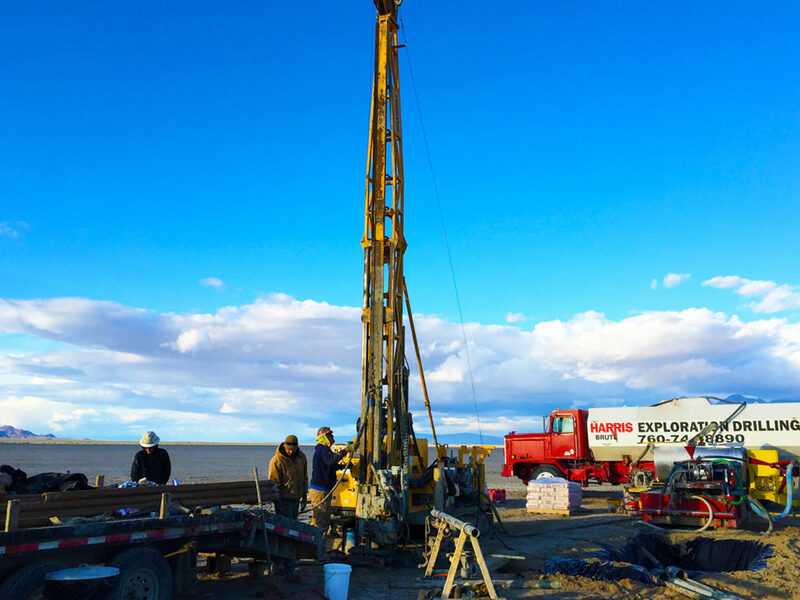 The Company has completed geophysics in the Big Smoky Valley and completed drilling in 2015. The project shares a similar geology and weathering history to Clayton Valley. The north end of Clayton Valley hosts Albemarle Corp.’s Silver Peak Mine, the only lithium brine producer in the United States. Mine production comes from a lithium enriched brine located below the surface. The plant has been in production since 1967 and is designed to produce up to 1.2 million kilograms of lithium per annum. In 2014, Ultra Lithium completed a CSAMT (Controlled Source Audio-Frequency Magneto-telluric) ground geophysical survey work on the Property. The survey consisted of eight CSAMT survey lines (Lines A through H) covering 53.8 km of data. The goal of the geophysical survey was to delineate the extent and depth of very low resistivities, and to map, if possible, faults that may influence brine accumula@on. In nearby Clayton Valley, lithium-bearing brines are known to be of very low resistivity and controlled by faulting. Commencing in the 1970s the United States Geological Survey (“USGS”) carried out a series of regional reconnaissance programs including sampling and drilling in Big Smoky Valley. Gravity surveys over the region also identified various structures that may have created topography favorable for evaporite accumulation and subsequent traps, which potentially could host commercially viable mineral rich brines. A study by Price, Lechler, Lear and Giles in 2000, suggests that lithium was released into the Clayton Valley basin by the weathering of high-lithium-bearing rocks. Similar lithologies and weathering history exist in the adjacent Big Smoky Valley. 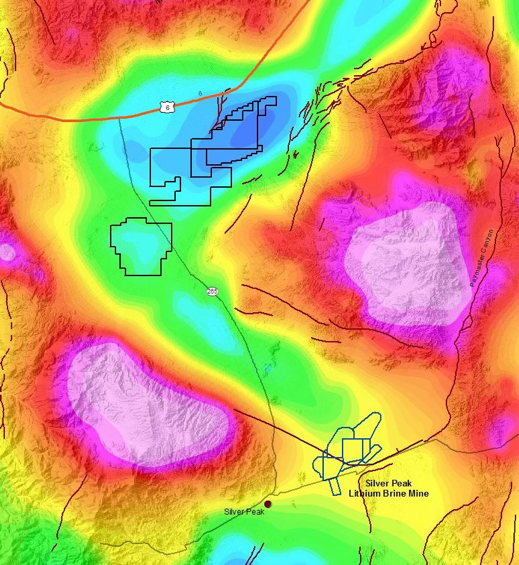 Map Image – Regional Bouguer gravity map suggests that the mine is actually at the South end of Big Smoky Valley.